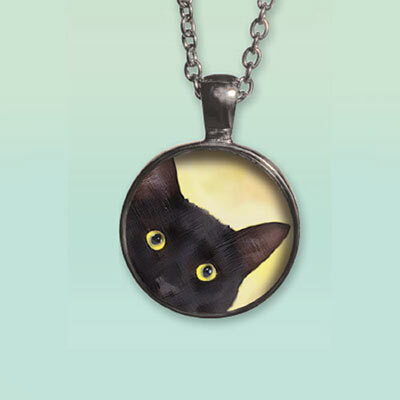 The curious kitty peeks out from a darling pendant crafted of glass and silver metal. This Cute Kitty Necklace is a classical design with a modern twist. Chain, 31"l with 3" extender; Pendant, 1½" dia. The necklace is very cute, glad I got it for daughter. Only problem was, I had ordered other things, and several items were not shipped. No explanation, no back order note, etc. Had to phone to re-order. Hope it gets here by Christmas. The necklace is a gift. Looks just like my daughter's cat Bug. Chain is excellent quatlity, the style the young woamen are wearing these days & the picture in the pendant so cute. I purchased the necklace as it is the spitting image of her cat. It was so real looking that she thought I had sent a picture of Stella.